Field Organisers will attempt to ensure there is at least one member in each search group qualified in first aid (e.g. current St John or Red Cross First Aid Certificate or equivalent). This person is responsible for all first aid administered by the group. 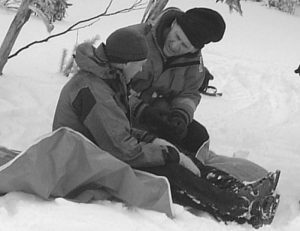 Bush Search and Rescue offers subsidies to members for completing appropriate first aid courses. All searchers should carry a first aid kit capable of dealing with most first aid problems. Your kit should be more comprehensive than you may otherwise personally carry on a bushwalk. All items in the list below are mandatory for all searchers. Triangular bandages Two, safety pins attached Use as a sling, broad or narrow bandage to support injured part or to retain a dressing. Elasticised roller bandage (heavyweight - pink) One 8 cm or 10 cm - safety pin attached Elasticised bandages for support and/or to control swelling of knee or ankle. With folded triangular bandage as a pad, used in treatment of snake bite. Crepe roller bandages (lightweight- white) One 2.5 cm and one 5cm, each with safety pin Crepe bandages to retain dressings, bandage and support hand, arm or thumb. Assorted adhesive dressing strips and tape eg Band-aids and Handipore For minor lacerations (cut to size). Include some tape that is hypoallergenic (i.e. does not cause skin irritations). Prepared wound dressing One medium size Absorbent pad for large lacerations. Effectively controls haemorrhage when applied with an additional firm pad. Semi permeable film dressing One small packet Hypoallergenic, breathable, sterile membrane for wounds, abrasions. Non-stick sterile dressings One 8x10 cm, eg Melolin Useful on burns or other areas where skin is broken. Place the shiny surface towards the wound. Thermometer Used to monitor the condition of the casualty. Sewing needles Two For pricking blisters, removing splinters, etc. Sterilise before use. Disposable cloth towel One small (Chux or similar) Use as washer and towel to clean around wound (adhesive tape will not slick to dirty or greasy skin). Washable. Note-book and pencil To record items used and the condition of the casualty. Rubbish bin liner bag One large bag For use with hypothermic casualties. Iodine based antiseptic One 25 ml container e.g. Betadine Bacteriocidal/fungicidal gel for cuts, abrasions, Tinea. Use as a gargle when diluted. Eyewash - saline sachets 2 x 10 ml To clean a dirty wound or wash out small foreign bodies trapped under eyelids e.g. grit or insects. Single use ampoules. Paracetamol tablets 24 foil packed eg Panadol soluble One or two tablets dissolved in half a cup of water every three to four hours for pain. Maximum 8 tablets per 24 hours - casualty to self administer with plenty of fluids. Oral rehydration solution Five sachets eg 'Gastrolyte'. Use according to sachet directions. For replacement of fluid and electrolytes in treatment of diarrhoea, bad burns or heat stress. Diabetics should obtain prior medical advice regarding emergency use of such products.